In order to provide ease and simplicity of accessing the information about Sony DSLR-A100 Manual, here we provide the Table of Content for this article. With this table of content, you will be able to get to the certain part of this writing practically by clicking on the sub topic below. It is generally known that a manual book is something that we can’t separate from an electronic product such as digital camera. With this manual, user will be able to get reliable information about the camera itself. Therefore, whenever a user wants to learn more about the camera he/she is using, referencing to the camera manual will be the best thing to do. Further, not only for user, a manual is also beneficial for enthusiasts who fond of to the certain camera product. From here, they can gain a lot of information regarding to the specification, setting, features, Camera parts, and so on. Therefore, we can say that a manual can be complement for a camera product. This is also the reason of why we aim to bring the Sony DSLR-A100 Manual here. With this manual, we hope that we can help both user and enthusiast to learn more about this Sony camera product. Well, before jumping in to the Sony DSLR-A100 Manual, here we are going to talk about the specification of this product first. And to start the discussion, we will begin with the most obvious thing first, the overall look of it. As we see, photography is the hobby for millions of people all over the world. In the recent era, everyone can be photographer at least for their own social media to share their stories through pictures. Seeing this golden opportunity, many digital cameras compete to win their heart by releasing the most-updated product with promising features. For other review about this Sony DSLR product, visit this page. Sony is one of the popular leader in digital camera field. This company have proved their existence from past to now on. One of Sony’s products that is deserve to watch is Sony Alpha DSLR-A100. This product has launched on June 2006 and become the brand new starter for this manufacturer in DSLR business. Comes with 5.2 x 3.7 x 2.8 inches body dimension, this camera brings futuristic outlook. It is such a pride to bring this gadget everywhere, moreover the overall weight is just about 638 grams with battery is included. Further, this monster is designed with the combination of black and gray so it has solid and glossy case. It is very easy to recognize Sony Alpha DSLR-A100 since the designer adds special symbol of alpha over the camera. Talking about specification, the more detailed information about it can be found in Sony DSLR-A100 manual. But, for the simpler explanation, here we enclose the resumed version of Sony DSLR-A100 manual. As the first product, there are many people doubt about this product. But, in fact, even it is the first ever Sony’s debut in DSLR business, you really cannot underestimate the superiority of this product. DSLR-A100 is set by 10.2 megapixels sensor resolution with CCD technology. It means that there are at least 10.200.000 sensors inside this gadget. This sensor works very well in creating clear and sharp photos by its Anti-Dust Technology. Now the low light won’t be the obstacle anymore if you are using this amazing camera. It is said so because A100 is bundled with pop-up flash. Moreover, through 2.5 inches LCD Display over the case, you are capable of reviewing the taken photos clearly. This LCD is constructed by 230.000 dots to bring high images quality. Everything is just so perfect from Sony DSLR-A100. Sony makes its successful trial on DSLR area. You really can’t wait to make my first shot with this device, don’t you? So, before that, let’s hear the short comment from the account “rpmendes”, one of A100’s users. He said that this product is a nice camera and he found no problem so far. And talking about price, you should prepare 395 USD to own this camera product. 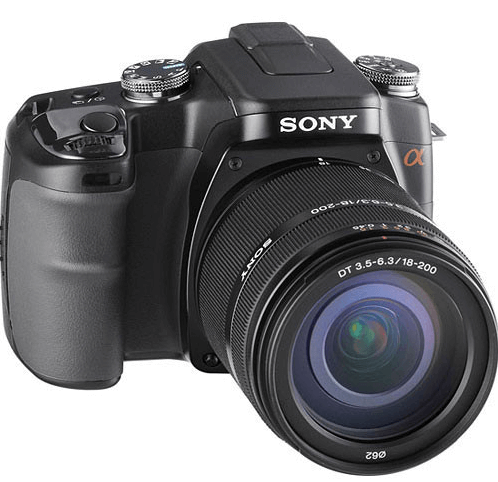 The aim of this article is to provide the Sony DSLR-A100 manual. With this manual, we hope that we can help both users to understand more about this product. So, at the end of the day, they will be able to operate this camera better as well as treat it better too. And for enthusiast, the Sony DSLR-A100 manual below will be the best reliable source of information. So whenever you need information about this product, referencing to below manual will be the great idea. But, one thing to note is that we provide the manual in PDF file format. So, before downloading it, make sure that you have PDF reader software installed in your device. Finally, that’s all of the information that we need to share regarding to this camera product and its manual. With this information, we hope that we can update your understanding toward this camera product. And whenever you face a problem in your DSLR-A100 camera, you can use the Sony DSLR-A100 manual above to solve it. Further, if you have any other ideas about it, we welcome you to put them in the comment session below. And if you think this Sony DSLR-A100 manual is helpful, you can share this writing in your personal page. So, we can spread the information here wider.